Decimation (R < 1) / upsampling (R > 1) factor, e.g. 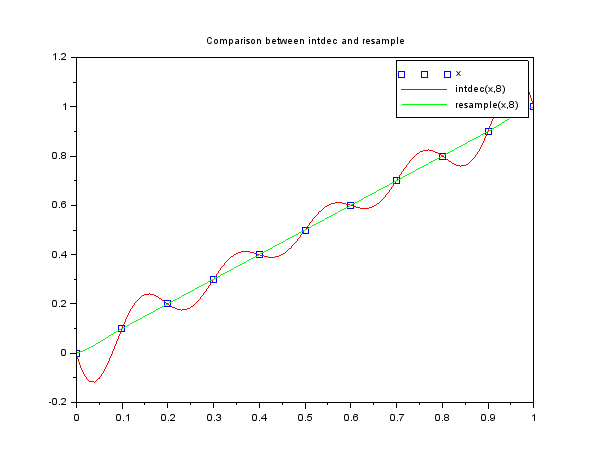 ratio between the output and input sample frequency. Better mastering of the frequency response (aliasing rejection), contrary to DFT method. The possibility to choose the interpolation algorithm to use (currently supported: cardinal cubic splines, linear and lagrange). The default implementation is based on the cardinal cubic spline interpolator. Note the importance of the leakage effects in intdec function, due to the hypothesis of periodicity (introducing a big discontinuity between the end and the begin of the signal).